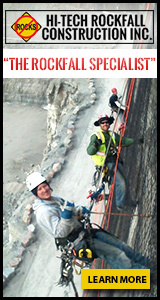 The AEG Foundation is dedicated to advancing research, student and professional education, and public awareness in the field of engineering geology and the related fields of environmental geology and hydrogeology through support of publications, speakers, programs, research grants, scholarships, advanced practice specialty conferences, and maintenance of archival data. The programs of the Foundation are supported by public and corporate donations and by bequests. The AEG Foundation manages ten funds including four scholarships. Current applications and details are available at the AEG Foundation website. Scholarship amounts, number, and application criteria are subject to change. For more information about the AEG Foundation and its programs, click here. The Beardsley-Kuper Field Camp Scholarship Fund provides grants to support students with geology field camp costs with applied environmental and engineering geology that will be useful to the students' future profession as an environmental and engineering geologist. Grants from the Beardsley-Kuper Fund may be used by recipients to support the direct costs of field camp tuition as well as meals and lodging. The Lemke Scholarship Fund was established in 2007 with a bequest from the estate of Richard and June Lemke. The fund supports student members of AEG who are sole or first authors of papers or posters presented at AEG Annual Meetings or at selected meetings of other professional or scientific organizations with which AEG is affiliated. The Martin L. Stout Scholarship is in memory of Dr. Martin L. Stout, Professor of Geology at California State University, Los Angeles from 1960 to 1990. He is remembered by all of his students for his passionate and insightful instruction in engineering geology. Dr. Stout guided his students through and beyond the fundamentals of engineering geology, often using Kodachrome™ slides for illustration. He emphasized hands-on experience and critical thought. Dr. Stout was well known for his expertise on mega landslides, his worldly travels, his good humor, and his gracious manner. This scholarship supports his legacy. The Norman R. Tilford Field Studies Scholarship fund was established shortly after Norm died in late 1997 while flying his small aircraft to meet a Texas A&M University student field trip. Norm was a leader in engineering geology, a Past President of AEG, and a professor at Texas A&M University. He was dedicated to teaching geology in the field. This scholarship supports his legacy. Lemke Scholarship Fund Applicants must be student members of AEG who are sole or first authors of a paper to be presented at an AEG Annual Meeting, or a meeting or conference sponsored, co-sponsored, or supported by AEG. Application deadlines vary according to the meeting calendar. Grant amounts vary according to meeting and available funding. Norman R. Tilford Field Studies Scholarship Applicants must be a student member of AEG. Two to three awards are given, typically one to an undergraduate and two to graduate students. The application deadline is February 1. *Award amounts are generally those listed. However, the amount of the award is determined by the AEGF and the Tilford Scholarship Committee and is subject to change." The AEG Texas Chapter Scholarship Fund supports geologic studies by students at the undergraduate and graduate levels. Recipients of grants must be students enrolled in an accredited Texas college or university, or graduate students enrolled in an accredited university outside Texas but conducting their field studies inside Texas. Awards will be made by the AEG Foundation to outstanding and deserving students based on demonstrated ability, scholarship, and potential for contributions to the profession, character, and participation in student/professional societies. Scholarship amounts, number, and application criteria are subject to change. Current applications and details are available at the AEG Foundation website. Note: Information is accurate as of compilation, and is subject to change. Open to Student Members of GSA and the EGD. Number of awards and dollar amounts may vary. Over the last two years, the Chapter has made contributions to university students to further academic achievement regarding costs of field trips, summer field camp, and field research. Any student who is majoring in geology (or earth science), is at least a sophomore, and is attending a four-year accredited college or university in the U.S. can apply. Also, the student must be either a student member of AIPG or must have applied for student membership at the time the application for the scholarship is submitted. Each student who is awarded a scholarship agrees, by accepting the scholarship, to prepare a 600- to 800-word article for publication in The Professional Geologist. The subject of the article must be related to a timely professional issue. The application deadline is February 15.